In many industrial, institutional, and commercial settings, maintaining walls can be a costly and involved process. Chipping paint, water damage, chemical exposure, and general wear and tear make upkeep a hassle. Oftentimes, time spent on wall repairs leads to disruptions in workflow and can leave rooms unusable for periods at a time in commercial settings. 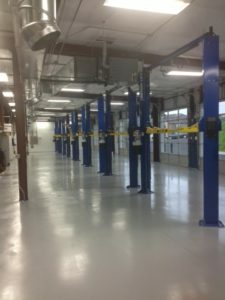 While most people are aware that epoxy coatings are a great choice for creating durable, low-maintenance flooring, many do not know that epoxy works just as well on walls. ArmorPoxy’s epoxy for walls are quick and simple to apply, and in no time create strong, hygienic, and easy to maintain surfaces that leave your space looking great. Particularly in settings where chemical resistance, light reflectivity, and sanitation are important; epoxy for walls is a perfect choice. It can prevent harmful bacteria growth and resist moisture that leads to dangerous mold. This is important for food preparation and handling areas, correctional facilities, locker rooms, hospital operating rooms, veterinary clinics, and more. Traditional latex paints, unlike high-performance epoxy for walls coatings, are not formulated with the proper abrasion and chemical resistant polymers necessary to hold up over time. On the other hand, scratches, scrapes, and other surface damage are no match for a quality epoxy wall paint. Epoxy for walls works by eliminating seams and cracks that can harbor water and cause unsightly and unsafe damage. Our epoxy for walls coatings work particularly well over concrete walls, which are prone to cracks and easily show flaws and imperfections. ArmorPoxy has specialized coatings and systems for containment areas and sections of plants, factories, and facilities that need to have full protection from liquids, splash and spills. From traditional epoxies to high acid and chemical resistant novolac coatings we can assist you with virtually any project you encounter. Our innovative “Job on a Pallet” kits make epoxy for walls coating systems applicable by anyone, no special training or skills required! Each kit comes equipped with all of the materials you’ll need, including step by step, easy to follow instructions. No job is too big or too small to utilize a top-notch, AmorPoxy epoxy wall paint. ArmorPoxy has a special line of non-sagging vertical epoxies, primers, and topcoats. Please call or email for info and pricing.